When two games love each other very much, they rub up against each other and spawn another game. 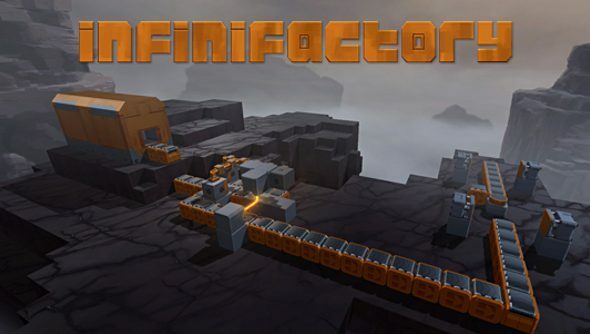 At least, this seems to be the case with Zachtronics’ Infinifactory, which looks a lot like a combination of the developer’s earlier games, Infiniminer and SpaceChem. Details are slim at the moment, but it’s going to be a sandbox puzzle game where factories must be constructed for a single goal: appeasing your alien overlords and their need for stuff. And working for aliens means working in alien environments, spread across over 30 levels in a story-driven campaign. SpaceChem’s nifty histograms are returning, as well. It’s a bit like cheating, really. You’ll be able to spy on your chums’ solutions to puzzles and then go back to your own factories and optimise them more. It’s a bit like staring at someone else’s monitor while you’re competing against them. Expect it to land on Steam Early Access later this year, where it will include Steam Workshop support so you can put together your own puzzles and grab new ones from the community.